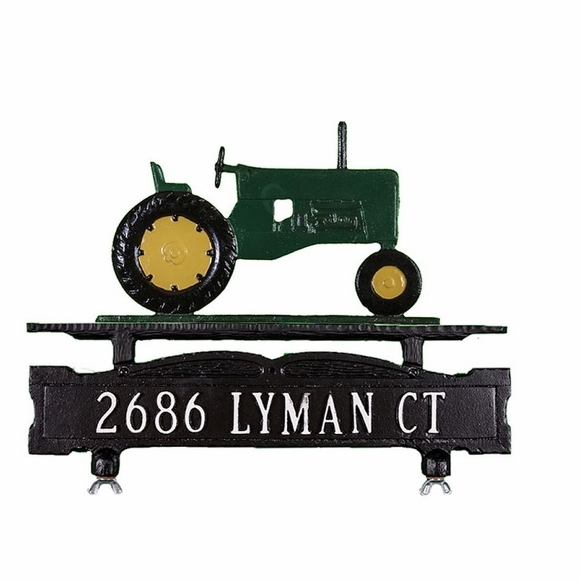 Tractor Ornament Personalized Mailbox Sign - - two-sided address plaque with either one or two lines of personalization and a farm tractor on the top. Designed to mount on a curbside mailbox. Made in America. Ornament colors: gold bronze, swedish iron, green multi-color, blue and black, orange, and dark red. Mailbox topper personalized address sign. Attaches to the top of a curbside mailbox. Quality mailbox sign. Plan to buy some for our children next Christmas. Just sent photo of sign and mailbox. Looks great!